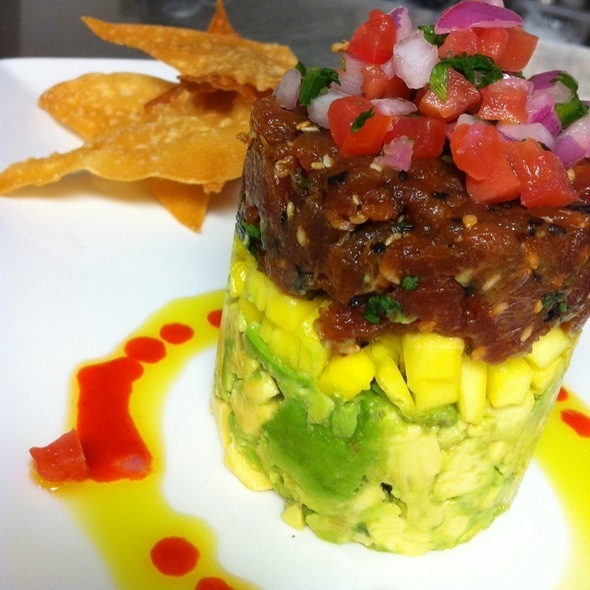 You must make reservations at least 5 minutes in advance of the time at Oceanaire Seafood Room - Houston. The Oceanaire provides the perfect setting to enjoy Ultra-Fresh seafood, flown in daily from around the world. Sip a cocktail in the lounge, take a seat at our grand oyster bar, or kick back in a horseshoe booth before diving into a sea of Ultra-Fresh fish, including steak-cut Alaskan halibut, seasonal favorites like fresh Copper River salmon or hard-to-find delicacies like true Dover sole or bluefin tuna. Our knowledgeable staff will delight you with exceptional service — guiding you through the wide variety of items on our menu and helping you select the perfect wine to complement your meal. 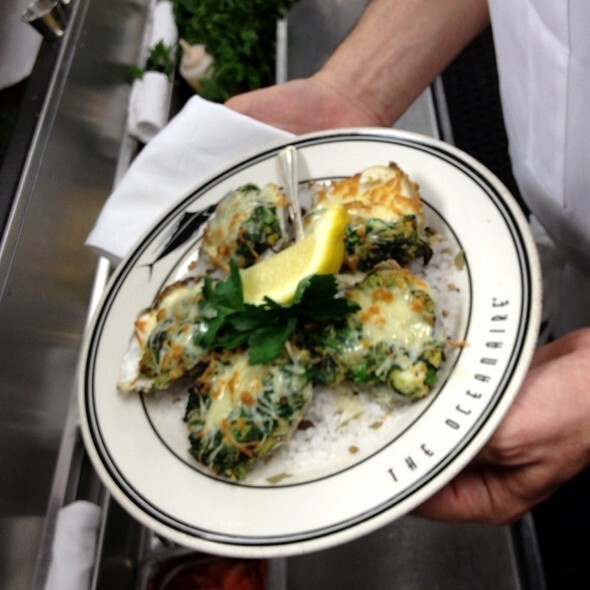 The world's freshest seafood awaits you at the Oceanaire. 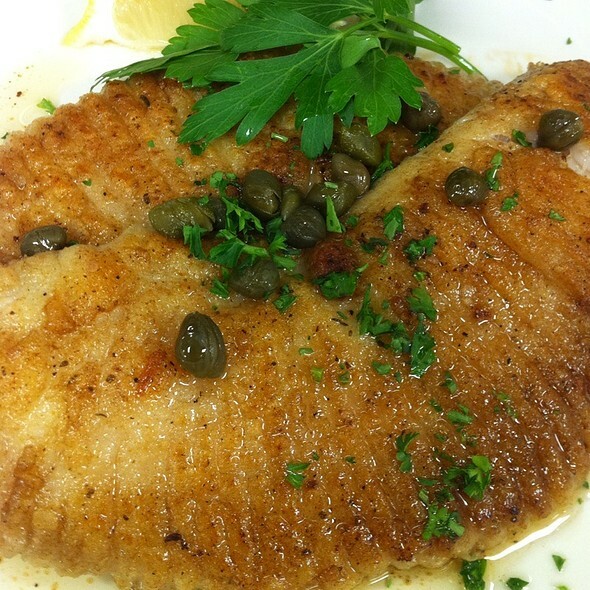 I believe that I had the best Dover sole of my life.My wife and I split the fish and fought over the scraps.. 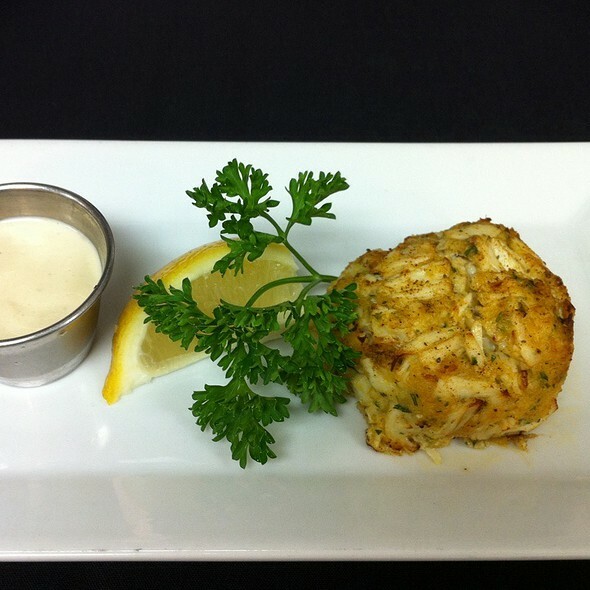 In keeping with the tradition of Lent and eating only fish on Fridays, we decided on a seafood dinner from Oceanaire. 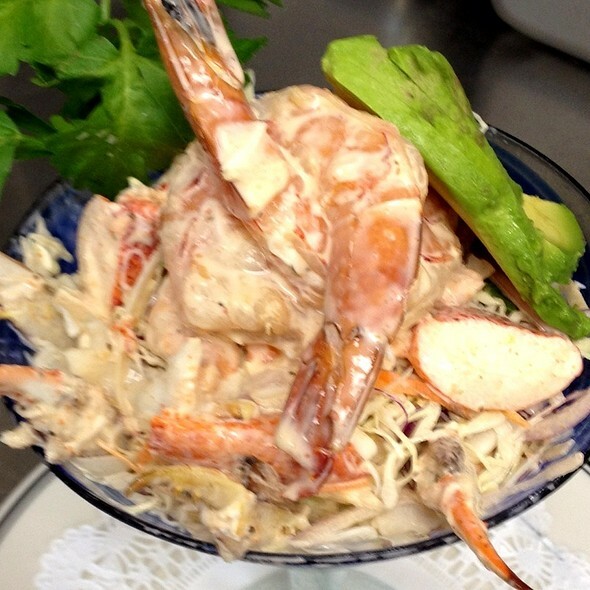 We absolutely loved all of our seafood dishes from start to finish. The appetizers were all delicious with beautiful presentation. My husband and I ordered the seafood mixed grill and it was truly the best mixed grill I’ve had here in Houston. The quality, freshness and portion sizes of the seafood variety was “seafood stellar”!! Luscious lobster and scrumptious shrimp and scallops were the three seafoods that made up the mixed grill. For a healthy green, we enjoyed the grilled asparagus that came with it. Thank you Oceanaire for taking great care of us on Friday evening and we look forward to another return!! Had an appointment in Houston so chose this restaurant because it served seafood and close to hotel. Outstanding food, wait service, ambiance, elegance, all around wonderful experience. Will definitely return when in Houston again. Loved it!! Food and service were very good but the menu items were significantly overpriced compared to similar-quality restaurants in the area. Loved almost everything about this place. Only thing wrong was the waiter just brought things and left. A fun waiter definitely makes the night even better. A highly enjoyable dinner in an outstanding restaurant. Great ambience and highly attentive knowledgeable friendly service. We had our main course fish simply grilled with a light butter sauce and they were both fantastic and cooked to perfection. The accompanying vegetables were also excellent. Very highly recommended. Top notch service, friendly staff. The halibut was outstanding, crispy outside yet tender on the inside. It was a good portion along with sliced squash. The cocktails were a bit pricey but tasty. Great food, however, if you plan on going for lunch DO NOT BE IN A HURRY!! I took my wife for lunch on a Friday and all told we were there GB or just over 2 hours with and hour and 45 minutes waiting on appetizers and entrees! The server was magnificent though and we felt bad for him as he had to continuously apologize for the slow kitchen. Great food, great service. Good size portions. Good recommendation from bar on a red wine! Would definitely go there again when in the area. Wonderful food, great service...always a pleasure to dine here. The Oceanaire and Executive Chef Steve Haug is hands down the best fine dining in Houston. Amazing food with even more amazing people. Always a pleasure to dine there. Highly recommend anyone to dine here for any occasion. We keep going back over and over and we are more and more pleased each time. Over cooked salmon. Sent it back and asked for it to go. Rather than comp the poor executed FISH order, they threw in a slice of cheesecake and called it even. There’s a reason they can’t fill their dining room on a Friday night I guess! The seafood is excellent, wine list extensive and appropriate, ambience very good. Service is always and consistently great. For special nights and for double dates with another couple, we tend to get a table. For a quick romantic drink with great snacks, we prefer the bar area. My wife and I went here for the first time ever and were pleasantly surprised by the prices and food quality. The restaurant was very nice and the atmosphere was vibrant. Our waiter was very helpful in explaining different options available from the appetizer, to the main course, and finally the dessert. 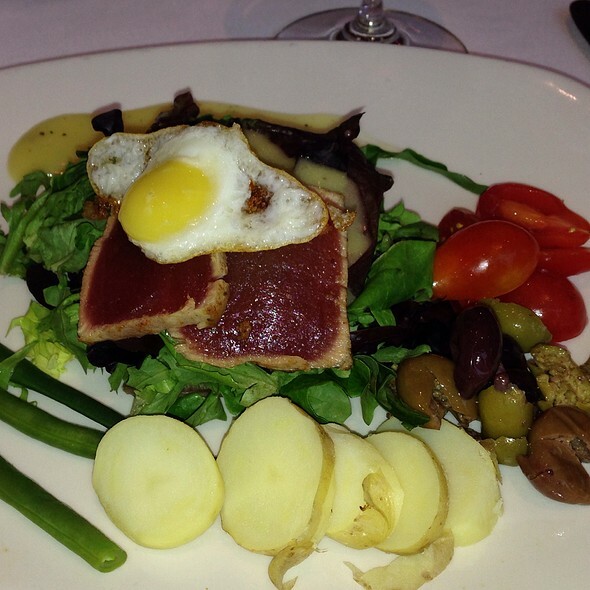 Overall my wife and I enjoyed our experience and we will definitely be going back to the Oceanaire. Please bring back the chocolate Baked Alaska. That is so delicious. The food was over cooked and salty. We also over ordered sides and the waiter should have warned us that we ordered too much but we noticed it was par for the course at another table when they ordered 4 desserts and one would have sufficed. Food and service were excellent. No complaints. Well maybe one little complaint. The mojito lacked bar syrup. But the sides and scallops were devine. And the desserts were delicious. Especially the bread pudding. We will all go again. My very favorite food is steak, My friend from out of town wanted to go somewhere nice to celebrate moving to Texas etc, so I choose the Oceanaire......We were both BLOWN away, Her Lobster thermidor was perfect and my 16oz New York strip was the 2nd best steak I have ever had, better than Ruth Chris and Morton's Steak house, no joke. I will be back for sure, pricey but SO worth it. We really enjoyed the atmosphere, on top of our knowledgeable server, Doug! First time and definitely coming back! Good Restaurant at the Galleria. The service was friendly but a little slow. I like this place. Nice Atmosphere. Check the Bar area for more casual lunch or drink at night. The best part was the food. Everyone enjoyed the meal. However we were disappointed in the level of service we received. The waiter did not provide a proper intro and just asked us if anyone wanted drinks or had in questions. He was also short and rude in his responses to the questions we had. We complained to guest services and were told he was one of their most seasoned on staffed and had a different sense of humor. We didn’t allow this to ruin our visit and the food being good helped, but this hurts when comparing Oceanaire to other top notch restaurants we have visited. It’s was my dad 80th Birthday and from the time we walked through the door it met our expectations. My dad was very pleased . We attended the Stags Leap food and wine pairing event. Excellent service, food and wines. Z and Andre made our night even better by providing fun and excellent service. We definitely will be back. Douglas was our waiter and he was excellent! He knew the menu like the back of his hand and was able to give great recommendations. The other servers were polite and attentive. The seafood was fresh and delicious! My husband and I love everything about Oceanaire!! The service is above and beyond excellence!!! The food is always amazing!! The ambiance & decor are so peaceful & relaxing. You never feel rushed. Pompey, our server, was great...very attentive & informative. This is our go-to place for celebrations and anniversaries. We look forward to our next visit. Thank you again!! The swordfish was cooked perfectly. The beet side dish was delish. My wife's filet was cooked and seasoned perfectly! Then wait staff were very attentive and professional. Overall great experience! We decided to dine at the bar and Chris the bartender did an excellent job of making it an enjoyable dining experience. The cocktail shrimp was a meal in itself, the potato crusted salmon was delicious and the drinks were great. Enjoy. My wife and I celebrated our anniversary. The menu is fantastic and the chef's specialties are outstanding. Highly recommend the restaurant for any type of seafood...they truly have something for everyone. I really enjoyed the food and the service was awesome!! We have frequented this restaurant over the years and have found the food and service have improved from earlier times and it is a pleasure to come back again and again. Amazing!!! From the seating staff to the chef everyone was great! Booked in advance for Valentines celebration meal. Requested a window table but advised on arrival that was not available however the feeling was relaxed and we looked forward to the experience as suggested by the web page etc. Seated at bar for drinks which never arrived and then seated at table and asked if we would like more drinks.!! We ordered drinks and, after watching the waiter run by us spilling the drink on the floor, the mess was wiped up but not enough to prevent a passing lady slip and almost fall. The drinks finally arrived and we eagerly ordered our appetizers which did take some time to arrive. The Crabcake was very good and the Buttermilk Fried Calamari looked good but unfortunately was over cooked and had to be returned. the replacement was not much better either. Our entree was not taken until we had started the appetizers creating another delay. Background music was pleasant and overall the impression was still one of good things to come. We both had the Snapper which was enjoyed and well cooked. Overall the attention to detail was not as expected. I am a Landry's Club member and enjoyed many superb meals but this one I am afraid did not succeed. It was awesome! Great food! Great service! Must go! Michelle our server was fabulous. She was knowledgeable about wine menu and food options. She was funny and very attentive. We got seated earlier than our reservation time. Manager came by to see how things were going and iced out bottle of wine. Was busy and packed but, we felt like we were the only ones there. Would definitely go back again.